Following an audit of the organization, officials found the charity’s activities did not fulfill the education guidelines required by the agency. “While we have determined that the organization’s services for the sick consisted mostly of charitable activities, our audit did not identify any activities advancing education in the charitable sense,” said the agency in a long letter dated Friday, January 16th. Instead, the agency goes on to say, “It is our position the organization’s primary focus remains on advocating for alternatives to preserving human life and selectively informing the public in support of its political purpose to expand choice in dying.” In Canada, while charities may a have nonpartisan, political focus, they cannot promote or pressure an “attitude of mind” that could influence legislation, as apparently was found to be the case with Dying with Dignity. The Toronto-based charity, which has been advocating for assisted-suicide rights since 1982, has accepted the decision and will not fight the revocation of their status. Instead, the organization will continue to exist as a nonprofit without the status of a registered charity, though this means that donations to the group are not tax deductible. This wouldn’t be the first time the charity has been deregistered or audited. Dying with Dignity lost their status back in February of 2010 after failing to file their tax forms. (The group registered once again in 2011.) According to Morris, the group has also been audited before, “so it’s puzzling why it’s happening now.” It seems that Dying with Dignity has been caught in the web of Canada’s conservative government, which started its special auditing of charities’ political activities back in 2012. The $8 million program first targeted environmental groups and then grew to include groups focused on human rights, poverty, and religion, among others. While observers expect another 60 groups to be audited by 2017, there’s one group in the same boat as Dying with Dignity—Alternatives, a Montréal-based charity that helps fund health and education in the Third World. Alternatives, too, was told their charity was mistakenly registered due to an error years ago and that their status would be stripped. Currently, the charity is working with the agency to find a way to retain their status. The agency’s decision comes at an auspicious time, as the Supreme Court of Canada is about to rule on physician-assisted suicide. 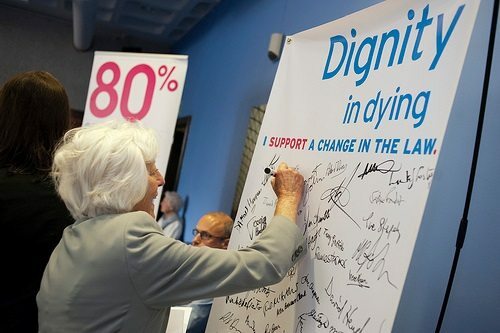 While an overwhelming 84 percent of Canadians voted to support physician-assisted suicide last October, the Conservative government has stated on record that they oppose the measure and do not support any change to the current law against assisted suicide.